This is one of those meals that fills your home with good smells and makes everyone feel all warm and fuzzy on a cool day. I only make this on weekends because it takes a few hours, but it is so worth it. Even the leftovers are great. If you like chicken noodle soup and chicken pot pie, I'm pretty sure you'll love this. There are many different ways to make chicken and dumplings. Some people make fluffy drop-style dumplings, some people make biscuit-style dumplings, but my mom and I agree that the best dumplings are thin, slippery, and noodle-like. In Delaware we call them "slippery dumplings". Maybe other people call them something else. Maybe other people have never experienced them. All I know is that if I came home after a long day during the cold weather months I would love to have a pot of chicken and dumplings on the stove. This recipe isn't complicated, but it's just time consuming with all the chopping, browning, simmering, and stirring. First, prep your veggies. I run mine through my Cuisinart food processor because I have to chop them really small to get my husband to eat them. Then you've got to get your chicken ready. I use about 3 lbs. of chicken and since we prefer white meat I use 3 large, bone-in, skin-on chicken breasts. Unfortunately, it's becoming difficult to find bone-in chicken breasts at the grocery store. I guess people don't like bones in their white meat. I season my chicken with salt, pepper, garlic powder, and paprika, then brown it before throwing in 1/2 of the veggies and a few minutes later, chicken broth, a bay leaf, and a bunch of fresh thyme. Then you just let it simmer for about 45 minutes (until the chicken is cooked). Now, the fun part. This is the part of the recipe that requires the most skill, but don't worry, you can do this. Dumpings! Add warm milk and melted butter to a mixture of flour and baking powder, then knead it to form a ball, roll it out, and cut it (I use a pizza cutter). Then you slowly drop those dumplings into the broth, one by one. Let them cook until tender (I like to let mine sit for at least an hour). Ladle the chicken and dumplings into shallow bowls, top with fresh parsley and dig in. The leftovers are great, too. Season the chicken on both sides with the salt, pepper, garlic powder, and paprika. Heat the oil in a Dutch oven and, when hot, add the chicken, skin side down, and cook until golden brown, about 4 minutes. Turn the chicken over and add half of the chopped onion, half of the carrot and half of the celery and cook until the thighs are lightly browned on the second side, about 3 minutes. Add the thyme, bay leaf, and chicken broth. Cover the pan and cook on medium heat until the thighs are tender and the meat pulls away from the bone easily, 30 to 40 minutes. While the chicken is cooking, combine the butter and flour in a small heatproof bowl and, using your fingers or a pastry blender, blend until smooth. Set aside. Using a slotted spoon, remove the chicken, chopped vegetables, thyme, and bay leaf from the cooking liquid and transfer to a plate to cool. Ladle 1 cup of the hot cooking liquid into the bowl with the butter-flour mixture and whisk to combine. 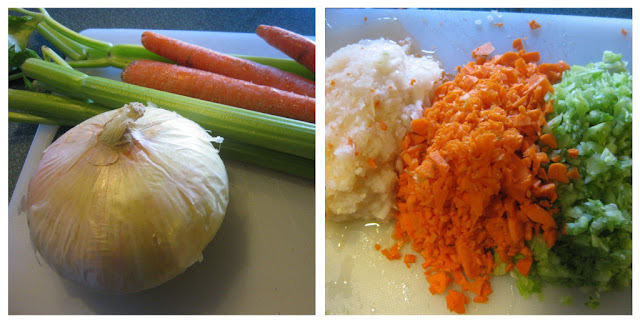 Add this mixture to the pan along with the onion chunks, sliced carrot and sliced celery and stir to combine. Cover and cook for 10 minutes over medium heat, or until the vegetables are just tender. While the veggies are cooking, make the dumplings by combining the flour, baking powder and salt in a small mixing bowl. Heat the milk and butter until warm and the butter is melted. Add the warm milk mixture to the flour mixture and stir until just combined. Transfer to a floured work surface and knead lightly once or twice. Using a floured rolling pin, roll to a thickness of 1/8-inch. Using a knife (or pizza cutter), cut the rolled out dumpling batter into 1 1/2-inch strips. When the chicken has cooled enough to handle, remove the meat from the bones and discard the bones, chicken skin and cooked vegetables. Reserve the meat separately. When the veggies are crisp-tender, uncover the pan and add the reserved chicken meat to the cooking liquid. Stir to combine, increase the heat to medium-high and, when the mixture comes to a boil, add the dumplings, 1 strip at a time, to the pan, using a spoon to gently submerge the dumplings in the hot mixture. Cook, uncovered and undisturbed, until the dumplings are cooked through, 7 to 10 minutes. Stir gently and serve in wide shallow bowls. That Looks FANTASTIC! I'm a super chicken soup lover. I'm going to try this next weekend. I love when you make this! You really are a great cook. Let me know when you make them again. Keeley, I just saw that you have bossy color blog on your blogroll. Thank you so much! Your blog looks fantastic - and your photographs are terrific. I got a Crock Pot - excuse me, "slow cooker" - for Xmas, so any recipes you have for that, feel free to share! Happy blogging, and thanks again! This is definitely on my "To do" list. This looks way too tasty. I appreciate your comments. Contact me at keeleycancook (at) gmail (dot) com.